The Active Orthotics meet the needs of the active individual while adapting to a variety of shoe styles. Suitable for heel pain, arch fatigue, plantar fascitis, neuromas and pronation. Features intrinsic fore foot and rear foot posts. The Active orthotics are a general use orthotic. The Active Orthotics meet the needs of the active individual while adapting to a variety of shoe styles. Suitable for heel pain, arch fatigue, plantar fascitis, neuromas and pronation. Features intrinsic fore foot and rear foot posts. The Active orthotics are a general use orthotic. Heat Moldable - please view the heat moldable instructions. We ship you the materials to create an impression of your foot (instructions, impression kit, questionnaire, return shipping label). You fill out the questionnaire and follow the instructions to create impressions of your feet. Make a trace of your shoe's insoles, old orthotics, or foot on the back of the questionnaire so can determine the length and width for your new pair. You seal the impression kit with provided shipping tape & affix the provided return postage label to the box. You then hand the impression kit to your local postman or post office. We receive the impression of your feet. The orthotics lab creates the finished orthotics. Finally, the orthotics are shipped to you. Delivery of orthotics usually takes 10-14 days after getting the foam impression kit back from you. Shipping is ~$12.95 for Continental US. The orthotic shell is individually machined out our unique "Betterform Plastics" and carry a lifetime guarantee against breakage and memory loss. Each finished insole is hand sanded to fit into the desired shoe. Orthotic coverings carry a six month guarantee and can easily be reworked. You can use in all type of activities after fully broken in, which usually takes about 2 weeks. Any shoe with a removable insole will work just fine. Please remove the original insole and replace it with the finished orthotic. Some shoes without removable insole will work as well. This device can be used in a shoe without a removable insole. The interior of the shoe should be relatively flat. The design of the shoe should be such that it does not deform the finished insole. A good example of this would be a high heel pump with a dramatic curve to the arch. This will deform the finished insole and not be comfortable. There is a section on the back of the order form where you can trace an outline of your removable insoles. If you want, you can also send your shoes to us. Please contact us before doing that. The impression kit accommodates feet up to 13.5 inches long and 5.5 inches wide. Neoprene Best for shock absorption and reducing friction while improving overall foot comfort. Popular for athletics, but great in all shoes. 2mm thick. Leather Offers a high level of air permeability and absorbability,keeping feet dry and hygienic. 1.5mm. Additional adjustments can be made to your orthotics, for instance if you received a prescription from a podiatrist or some other foot care specialist we can take that information into consideration. Simply put that information on the order form we send out to you with the impression kit. Metatarsal pads provide extra cushioning at the ball-of-the-foot, helps eliminate pain, improves spring action of foot, and also helps treat Morton's Neuroma. Ball-of-foot pain is most pronounced when walking or engaging in sports. Since the foot supports the body in all its activities, chronic ball-of-foot pain impacts the ability to perform ordinary tasks. If you experience pain when participating in activities where impact is applied to the foot, such as running, you may want to wear a metatarsal pad to help ease your pain. 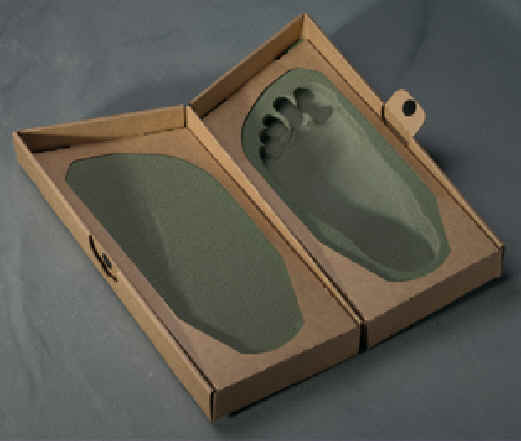 There is a spot on the order form that we send with the impression kit where you can specify if you want a metatarsal pad. See our help section on orthotics for frequently asked questions. The process from finding the product to fit my need, to it ordering online, receiving forms for feet and to the delivery of the product was very easy and timely. My only suggestion would be to give a estimate of the final product delivery date at the time of ordering.